Resource awareness is an important step towards the realization of adaptable software, something which is particularly desirable in the context of mobile code and mobile agent environments. Since resources (CPU, memory, network bandwidth, etc.) are not available and manipulable as first-class entities in standard programming models, such as in the Java language, some kind of reification seems indispensable. This is however diffcult to achieve, especially if portability is a requirement. 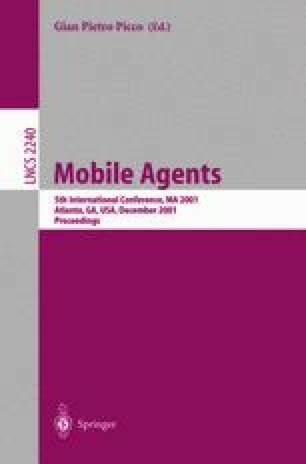 In this paper we describe a mobile agent execution environment that reifies several aspects of both the execution environment itself and of the mobile agents it hosts. We explain how resources consumed by an agent are reified directly from the agent code. Performance measurements show that our approach incurs only moderate overhead. M. Dahm. Byte code engineering. In Java-Information-Tage 1999 (JIT’99), Sept. 1999. http://bcel.sourceforge.net/. The Standard Performance Evaluation Corporation. SPEC JVM98 Benchmarks. Web pages at http://www.spec.org/osg/jvm98/, 1998.